AT&T, Comcast, Boeing and Wells Fargo are among companies sharing the wealth from lower levies with workers. Most have reason to curry favor with the White House. So such deals may be less than they seem – while others will struggle to hold on to any benefits at all. 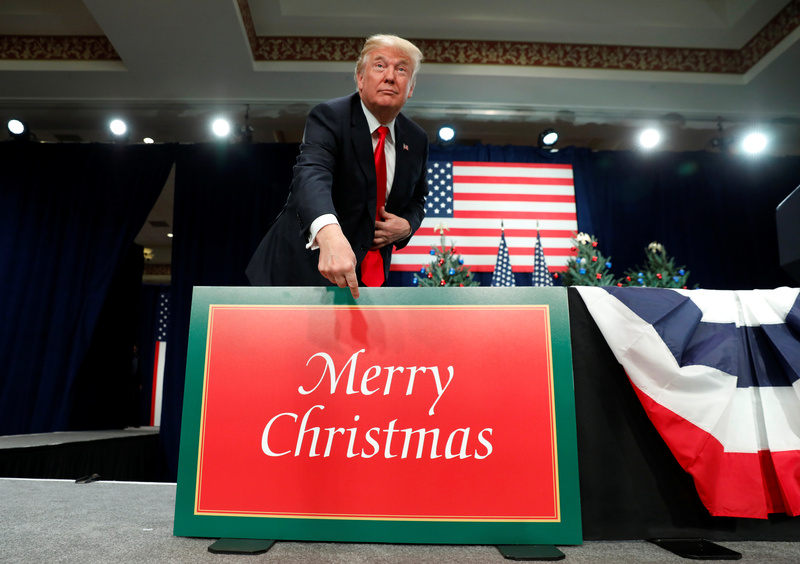 U.S. President Donald Trump points to a large "Merry Christmas" card on the stage as he arrives to deliver remarks on tax reform in St. Louis, Missouri, U.S. November 29, 2017. Several U.S. companies announced new investment and compensation plans after Congress approved a bill on Dec. 20 that would cut the headline corporation tax rate from 35 percent to 21 percent. AT&T plans to invest $1 billion in the United States in 2018 and pay $1,000 as a bonus to each of its more than 200,000 U.S. employees once the bill becomes law. The mobile operator cited research saying that $1 billion in telecoms capital investment creates 7,000 American jobs. Boeing said $300 million of investments would move forward, split equally between corporate giving, workforce training and facilities for the aircraft maker’s employees. Wells Fargo will raise its minimum hourly wage to $15, and aims to donate $400 million to community and nonprofit organizations in 2018 – with a target of 2 percent of earnings thereafter. The bank will also earmark $100 million of capital “and other resources” for small-business and community-focused lending. Cable company Comcast will award $1,000 bonuses to more than 100,000 non-executive and frontline employees.